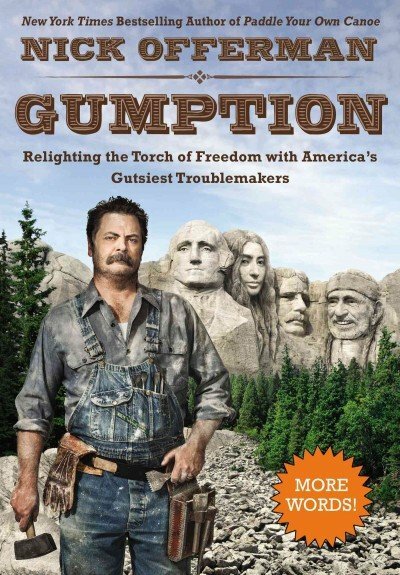 Until recently, Gumption: Relighting the Torch of Freedom with America's Gutsiest Troublemakers was not the type of book I would have picked up. 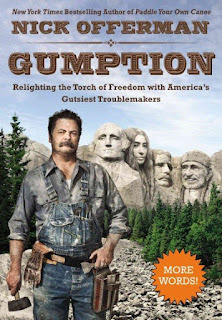 But, thanks to finally getting on the Parks and Recreation bandwagon, a recent interest in historical figures, and a well-timed offer of this book from a blogging friend, I broadened my horizons and had a fun time to boot with Nick Offerman. The basic premise of this book is that he evaluates twenty-one modern and historical figures and tells us why he thinks they've got gumption. It's a really interesting exercise and will certainly lead to readers composing their own mental lists. He's also incredibly funny, has a great vocabulary, and an adorable love for his wife, Megan Mullally. It also didn't hurt that he's only five years older than me so we come from the same time, if not the same place. Offerman's list includes politicians, authors, singers, craftsmen (and women! 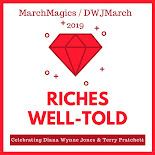 he rocks the equality message in this book), and performers. Sometimes his criteria is quite straight-forward but, other times, it veers in a more philosophical direction. Though I'm pretty sure he didn't mean this to happen, it really gave a lot of insight into how he thinks and what he values. P.S. If he now sounds too high-brow for you, rest assured that he also loves a good steak ... and farts. Anyway, I wanted to record my additions to his list. My criteria was simple: someone who makes a difference (for the better) in the world, who does things differently than those who have come before. I'm sure I have more additions but these were the first ones to come to mind as I finished reading the book. Who do you think has gumption?